My knitting has slowed to a crawl. I knew my trip in July would hinder my progress, but I didn't anticipate that even the Oddball blankets would stop coming. 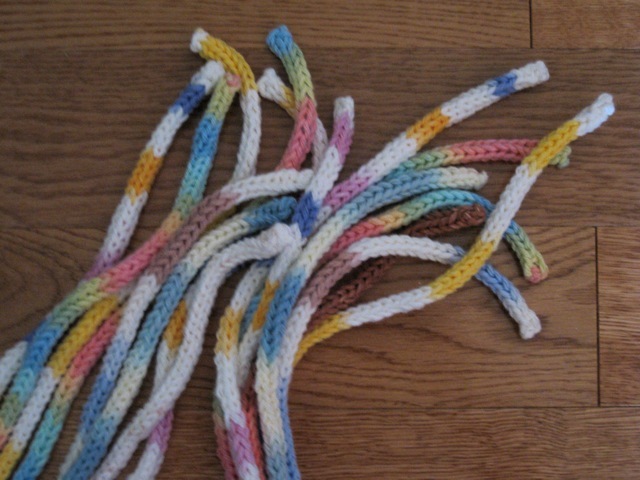 I rely on the Oddballs to give me a boost of enthusiasm and inspiration, but I haven't knit on one since June. I belong to two groups, so not having any Oddball for that long is very strange. 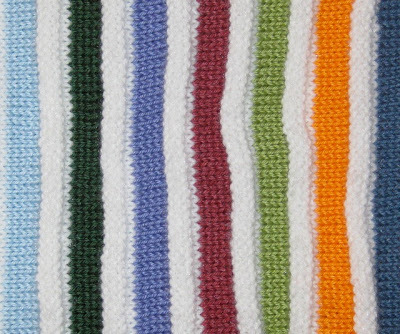 The Oddball forums on KnittingHelp.com and Ravelry have been quiet all summer: I hope it doesn't mean this project is dying. 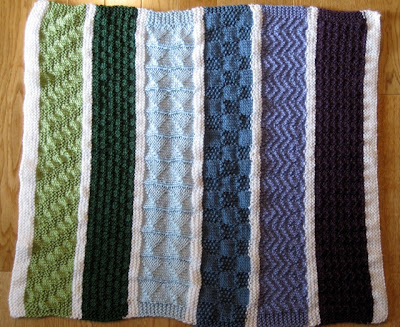 One of the coordinators contacted me in mid-June to ask if I was ready for a blanket, and I readily said, "Yes." 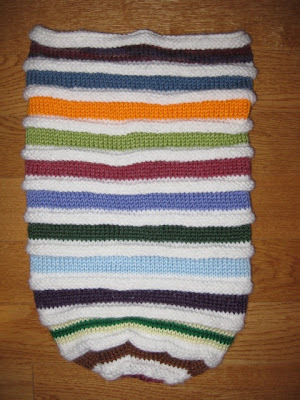 I was told the blanket was sent, but two weeks later informed that the knitter had not sent it. The blanket has yet to arrive, and now the coordinator cannot reach the other knitter. 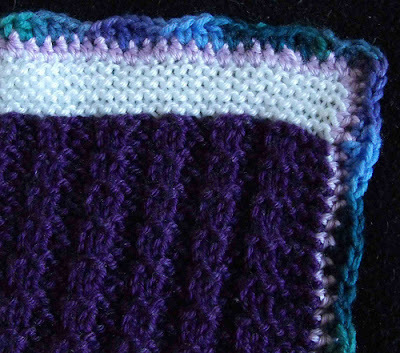 I might as well use the yarn that I was reserving for this little Oddball. Perhaps, it is time to find another projects for my Oddball tendencies. 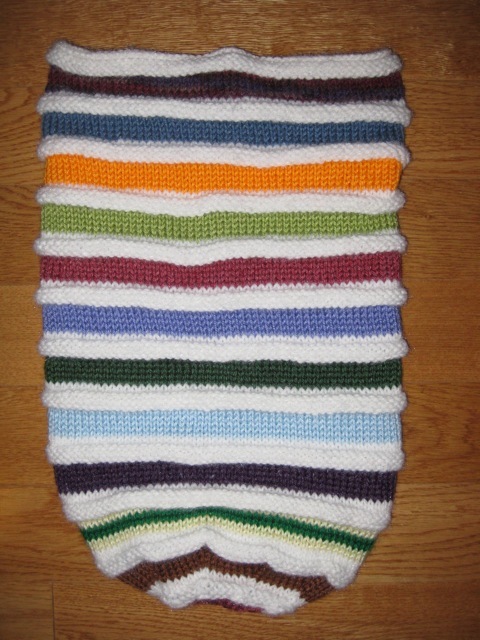 I had a great time knitting stripes and creating a scrappy Baby Cocoon Sack, but the more subdued colors shown on the pattern may appeal to your personal taste. 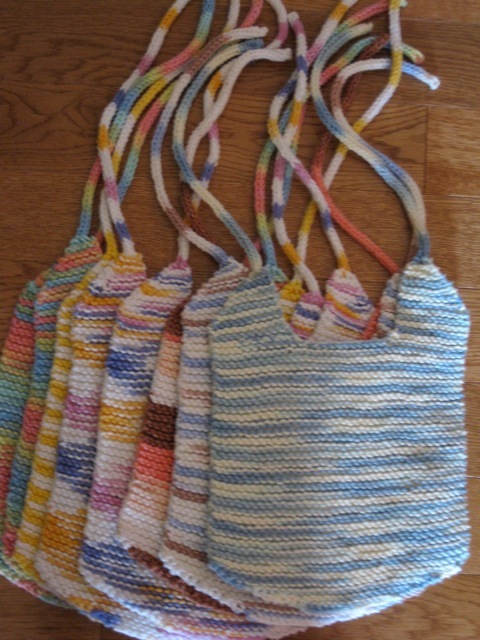 Bernat requires registration to access to their patterns, but registration and many patterns are free. I was so taken with the back of this quilt that I didn't realize until I got home that I didn't take a photo of the front! Isn't the back stunning? It was quilted with different colored threads. It was simply beautiful. 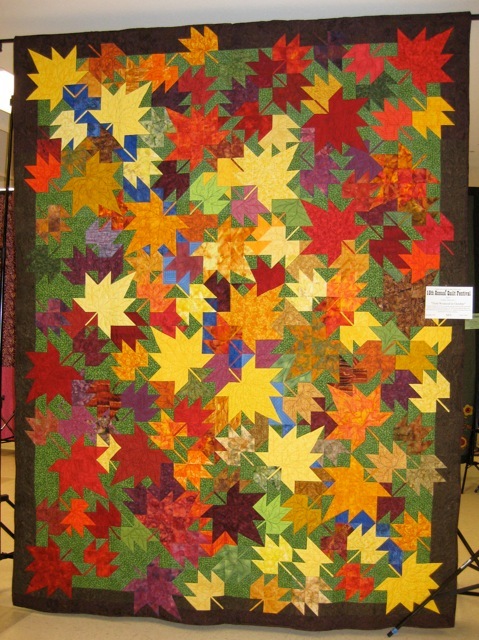 This Autumn beauty caught my eye as I wandered down the rows of quilts on display at the Dubois quilt show. When I read the information on the quilt, I couldn't help but giggle at the quilter's comment. Click on the photo to enlarge so you can read about the quilt. 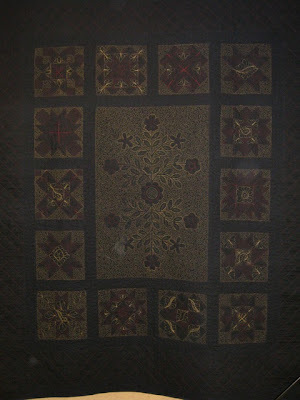 Despite its reputation, this quilt was by far my favorite. Remember this windfall? 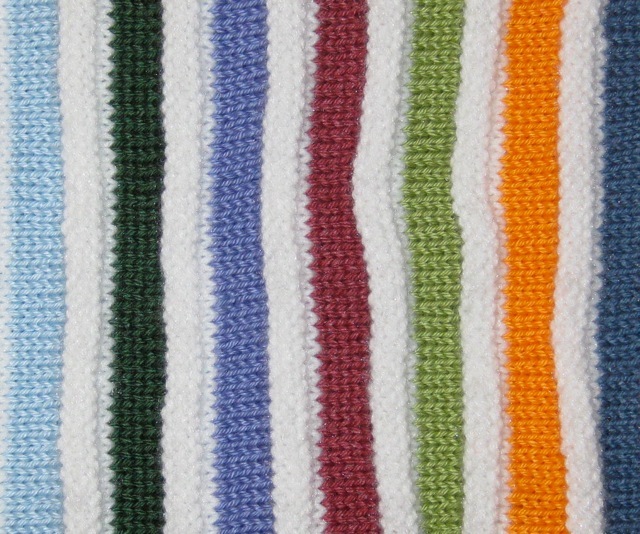 I'm gradually working my way through the baby-friendly colors with a project which involved knitting 16 feet of i-cord and lots of garter stitching. So far, I've made eight bibs, using this pattern. Each ball of cotton yarn makes a bib with a bit remaining that will be used to make some dishcloths. The bibs will be donated to a local pregnancy center. 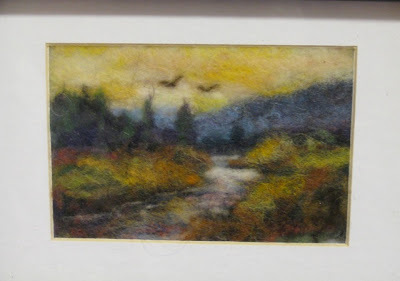 This picture appears a bit out of focus, but the scene is just fuzzy -- quite literally fuzzy since it is made from bits of wool roving. This hand-felted picture (sorry, I don't remember the artist) won a well-deserved purple rosette at the county fair. I was amazed at the detail in this 4 x 6 beauty. 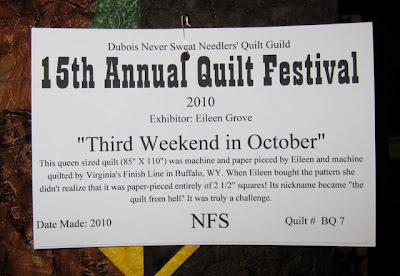 Last week was the county fair, but I didn't enter anything since I was gone when the entry forms were due. 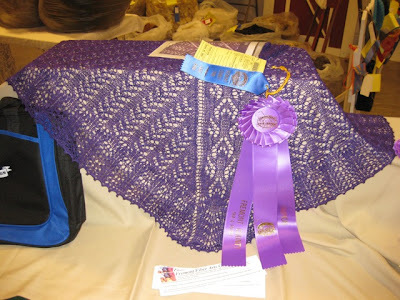 I was pleased, however, that one of my knitting friends won the Championship prize for her beaded shawl. Everyone who passed the table was in awe of the workmanship. Congratulations, Julie! Julie's winning shawl was from the 2009 Year of Lace program. She entered all of them in the fair. This plum shoulder shawl is my favorite. 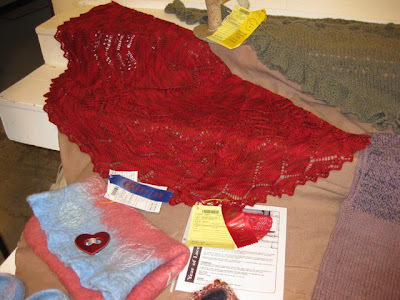 This red circular shawl (it is folded in half) was Julie's favorite to knit. I missed taking a photo of her green rectangular shawl, but you can see what it looks like here. 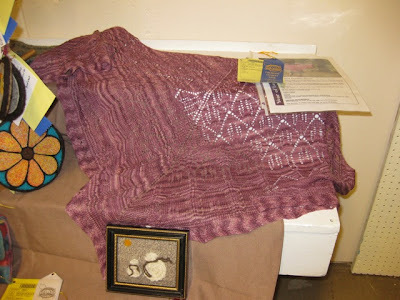 Julie liked making these four shawls so much that she enrolled in the 2010 Year of Lace. I'm sure she will enter them in next year's fair. My maternal grandparents hired a photographer to visit their homestead so they could show relatives in Russia how well they were doing in the New World. 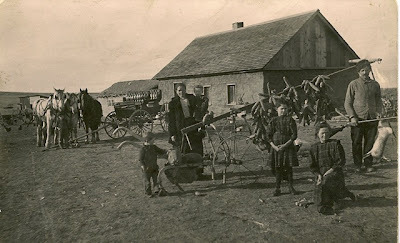 Note the display of farm produce, game, horses, buggy, and farm equipment. My grandparents were Germans who moved to Russia and then eventually to America. Both my grandmother and grandfather became American citizens and had eight children (four boys and four girls), five of which are shown in this photo. My mother was born after this photo was taken. Given flowers to a man? Over the years I have purchased flowers for two men. The first bouquet was a "Thank You" for setting up a private tour of the Denver Mint. Several years ago, senior classes were allowed to go on school sponsored class trips. Since I was a class sponsor, I was included in the trip's planning. It was suggested that we tour the Mint. At the time, my sister and brother-in-law had a friend who worked there. He graciously arranged for our special tour. I don't think the students realized just how special they were to actually be on the minting floor and see the machines up close and personal. I think the bouquet came as quite a surprise to the gentleman who went out of his way for a group of strangers. The second occasion was Monday when I gave a vase with three roses to one of the hospital employees who is always friendly and helpful. He and his wife just celebrated the birth of their second child. He was surprised and touched. I don't know a woman who does not enjoy receiving flowers, and I can confirm that men enjoy them, too. Do you know a gentleman who could use a little joy in his life? 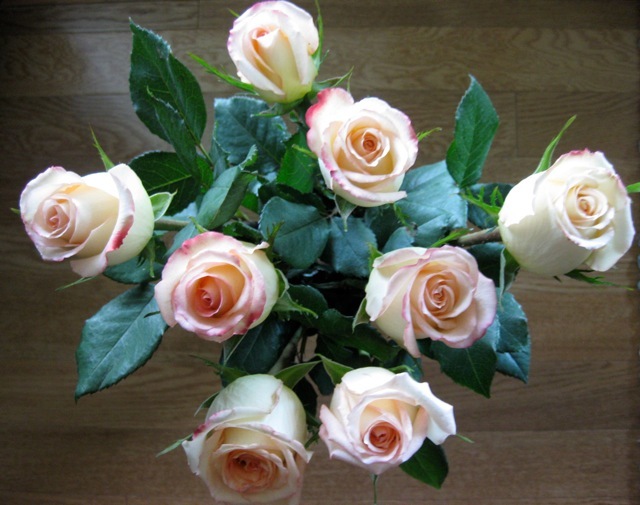 Take him a bouquet of flowers from your garden or from the grocery store. His smile will make your day. I've been recycling for years: in the early 1970s several teachers in Wheatland, WY started a newspaper recycling service. We picked up papers left on the curbside one Saturday a month and pitched in to rent a trailer to haul the collected papers to Denver, CO. Reflecting on those efforts now, I see how large of a commitment we made to the community, but we were idealistic and didn't know enough to really consider the obstacles we would encounter. We just did it! 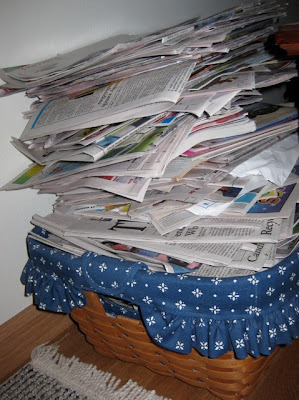 My current community has collected newspapers, magazines, white paper, milk bottles, cardboard, and aluminum at designated collection locations. Fast forward to 2009 when my town started curbside recycling to encourage more people to recycle and to increase the lifespan of the landfill. The basket (pictured above) is holding a month's worth of papers, junk mail, and unwanted catalogs. (I recycle my magazines at the public library and at the hospital.) I have containers in my garage for corrugated cardboard, aluminum and tin cans, #1 and #2 plastics, and all glass. Each week, the city picks up different items; thus, collecting items once a month. It is amazing just how much curbside recycling has changed the quantity of my garbage. The town council is raising garbage pick-up rates, but those who recycle will not see their rates increase. Do you recycle? I recommend it! 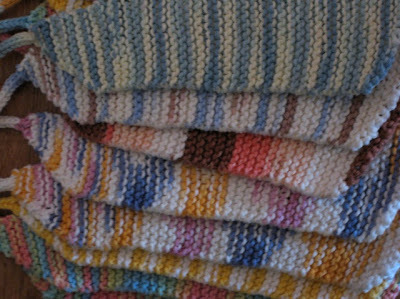 Settled at home and rested, I got the itch to knit. I found three sets of light and dark hues in my stash bin and used them to make an Oddball Baby Blanket. Any suggestions on what to name this blanket? 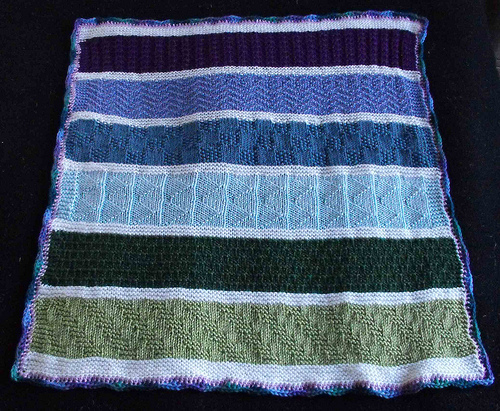 Update: The blanket has been named, Tranquility.